Lapwings are medium-sized wading birds belonging to the subfamily Vanellinae of the family Charadriidae, which also includes the plovers and dotterels. A lapwing can be thought of as a larger plover. While authorities are generally agreed that there about 24 species of lapwing, classifications within the subfamily remain confused. At one extreme, Peters recognised no less than 19 different genera; other workers have gone as far as to group all the lapwings into the single genus, Vanellus. Current opinion appears to be that a more moderate position is appropriate. A group of lapwings is called a "deceit". Spot-breasted Lapwing, Vanellus melanocephalus: Endemic to Ethiopia. Brown-chested Lapwing, Vanellus superciliosus: Found in Burundi, Cameroon, Central African Republic, Republic of the Congo, Democratic Republic of the Congo, Ghana, Kenya, Mauritania, Nigeria, Rwanda, Tanzania, Togo, Uganda, and Zambia. 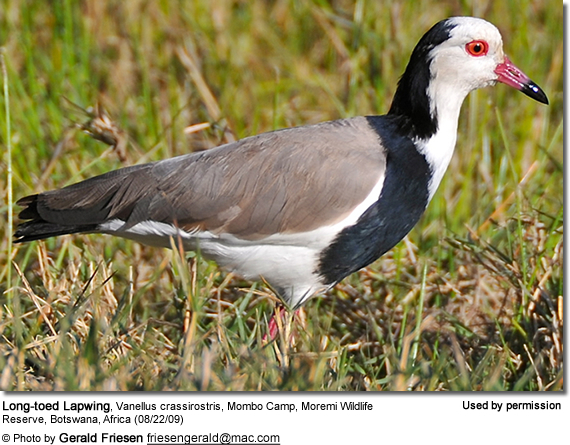 Javanese Wattled Lapwing, also known as the Javanese Lapwing, Vanellus macropterus : A wader in the lapwing family. This large, long-legged wader inhabited the marshes and river deltas of Java, and possibly Sumatra and Timor. It was last seen in 1940, and as it was a conspicuous species unlikely to be overlooked, it seems likely that it is extinct. However, following an unconfirmed record in 2002, the previous classification of "Critically Endangered (Possibly extinct)" was revoked, awaiting a last thorough survey in 2005/2006. Only Northern, Sociable, White-tailed Lapwing, Grey-headed and Brown-chested Lapwings are migratory species. Spur-winged, Blacksmith, River, Southern, Andean and Pied Lapwings are boldly patterned, red-eyed species with a spurred carpal joint. 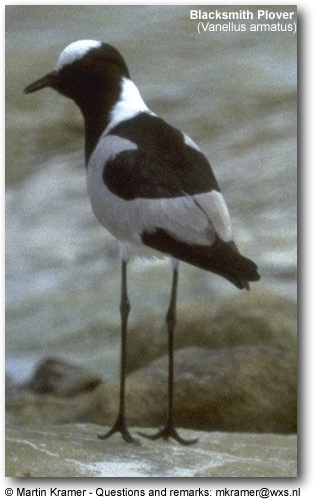 Many species have wattles which can be small (Black-headed, Spot-breasted, Red-wattled and Banded Lapwings) or large (White-headed Plover, African Wattled, Yellow-wattled, Javanese Wattled, or Masked Lapwings).